TNT Head. Blue eyes. Rooted eyelashes, Brown brows, Peach blush & lips. 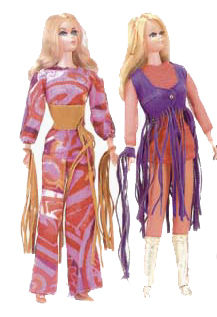 Notes: The Live Action version of Barbie was sold in 1971 and 1972 both with a stage (as Barbie Live Action on Stage #1152) and in a box without the stage (Barbie Live Action #1155). She was sold in a "baggie" (no box) in 1973, 1974 and 1976. Leave Live Action Barbie, Return to Mod Barbie Dolls.